The Minnesota Horse Council announced the selection of RaeDell Robbins of Cokato, Minnesota, as Minnesota's Horseperson of the Year. The announcement was made at the Council's Annual Meeting on January 7, 2006. Robbins, who has ridden and trained horses for many years, is recognized in the equine industry for her outstanding contributions to beginning and young riders throughout the state of Minnesota. 2005 was the thirty-sixth year of the award. Best known for her outstanding work with youth, Robbins helped found the Hennepin County Hoofbeats 4-H Club. She has been a horse project leader for over 25 years. Last year at the Minnesota State 4-H Horse Show, she received the "Green Blood" award for outstanding 4-H horse project leaders. She has been coach and teacher of Hennepin Hoofbeats Horse Bowl and Hippology program since 1984 when she took a team to Nationals in Harrisburg, Pennsylvania. Several more national trips followed. She introduced the "Equestrian of the Year" contest for over 10 years--donating a yearling to the winner the first year. The contest has six areas of competition including speaking, riding, and judging, to broaden the horizon of the horse world for youth. Another venture she started is "You Can Ride Too". The program gives the horseless beginner kids the opportunity to ride by matching them with a 4-H mentor for a series of lessons in the summer. Two years ago she introduced the "Horse Dancing Show" which is growing in interest. For several years she has been responsible for many of the club's horse camping weekends including introducing Trail Trials. She has arranged leases for young riders who did not have horses of their own. She has extended her love of animals by being the 4-H leader of the Heelers (Dog project 4-H club) and Hoppers (Rabbit project club.) She introduced Rabbit agility to Minnesota 4-H at the State Fair with several demos for the public along with writing a Rabbit Agility Guide and Rule Book and giving a clinic this January. Her love of young people, horses, and other animals provide her the opportunity to encourage proper care, fun and love of the horse and other animals. Robbins, who earned her first degree in Communications, went on to study at the University of Minnesota, Crookston. There she received her degree in Equine Management. She taught riding and trained with such well known horsemen as Pat Jensen (Pat Jensen School of Horsemanship) and Ernie Wood (Westwood Stables). She also taught riding, trained and managed operations at Tri Oaks Stable in Waconia, MN. 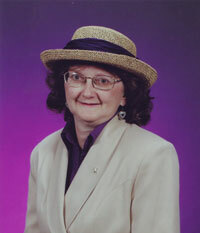 While at Tri Oaks, she worked with and helped develop Twin Hills Happy Horsemen 4-H. Working with Mona Bonham (Bonnie-Lee Farms), she helped develop the well-known Kandi Klassic Morgan and Open Show in Willmar, MN. The show continues to grow to serve many exhibitors in diverse events. Robbins, husband Tim and children Wil and Becky, raise and show Morgan horses from their farm in Cokato, Minnesota. Although fighting a battle with cancer since 2002, Robbins continues to share her knowledge and talents in the equine industry.